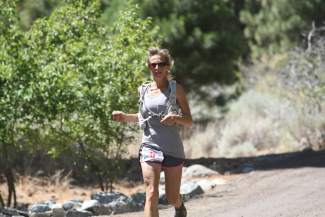 Norah Gastelum of Gardnerville competes in the Genoa Peak Madathon on Saturday. Runners from across the country will on hand Saturday for the second annual Genoa Peak Madathon marathon and half-marathon races in Genoa. They could just as easily be described as mountain climbers considering the event features the “Completely Mad” marathon with more than 5,000 feet of climbing to the top of 9,150-foot Genoa Peak and back, as well as the “Only Half Mad” half-marathon course, which rises to an altitude of 6,300 feet. The marathon starts at 6 a.m. and the half-marathon at 6:30 a.m. from Genoa Park, located on Nixon Street in downtown Genoa. Race director Kevin Bigley noted that the event has been included on Trail Runner Magazine’s Trophy Series, a points series of trail races being held in the U.S. and Canada from March through September this year. Entries have already been received from Massachusetts, Virginia, Maryland, Illinois and Florida. Registration will remain open for both races through Wednesday. There is no clear favorite to win either the men’s or women’s divisions since neither of the two defending champions are coming back. John Fitzgerald was the overall winner last year in 4 hours, 15 minutes and 25 seconds, and Hannah Riedl was the women’s winner in 5:07:02. Among those local runners are the marathon runner-up finishers from last year: Paul Sweeney, 48, and Betsy Nye, 49, both of Truckee. Both are accomplished ultrarunners who just last month finished the 100.5-mile Hardrock Endurance Run in the rugged San Juan Mountains of southern Colorado. Nye placed third among the women and 59th overall at Hardrock while Sweeney finished 31st overall.